I am reporting on the absolutely fabulous, amazing, and incredible 25th Annual International Conference on Virginia Woolf hosted by the brilliant and scintillating Julie Vandivere and her devoted co-conspirators, including the intrepid and undaunted Erica Delsandro as well as the ever-present, deeply wise and dedicated Megan Hicks and Emma Slotterback and everyone else who worked so hard to create something so memorable and durable — a conference that is a gift to marvel over and recall with great pleasure. The papers, panels and plenaries were all inspiring and dynamic and brilliant. The opening reception was gracious and intimate. 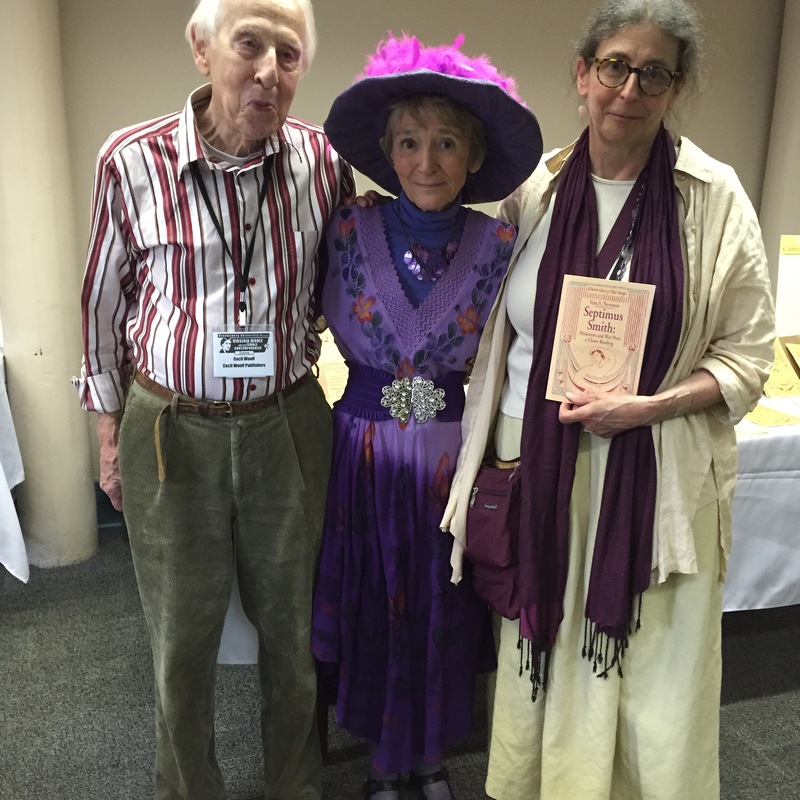 Cecil Woolf and Jean Moorcroft Wilson arrived at the conference on Thursday with numerous copies of Bloomsbury Heritage Series pamphlets. Bloomsburg itself was beautiful, as was the university campus, and the restaurants in the town were delightful. The performance of Septimus and Clarissa, with the playwright, Ellen McLaughlin, taking the part of the older Clarissa, was stupendous, and Mrs. Dalloway’s Party, which followed the performance, offered an abundance of tasty tidbits as well as hilarious opportunities for the attendees to try on a variety of vintage hats, activities resulting in many, many photographs. The food at the conference was abundant and delicious. At one break, mounds of whipped cream, fresh strawberries and sponge cake were served. And the banquet itself was nourishing for both the mind and body, a wonderful chance for creating new friendships and spending time with those one sees so rarely. Jean Moorcroft Wilson interviewed Cecil Woolf at the banquet in a wonderfully playful but also quite substantive fashion — one of the many high points of the conference. And, as always, the Virginia Woolf Players read from Woolf’s works as the closing event of the gathering. 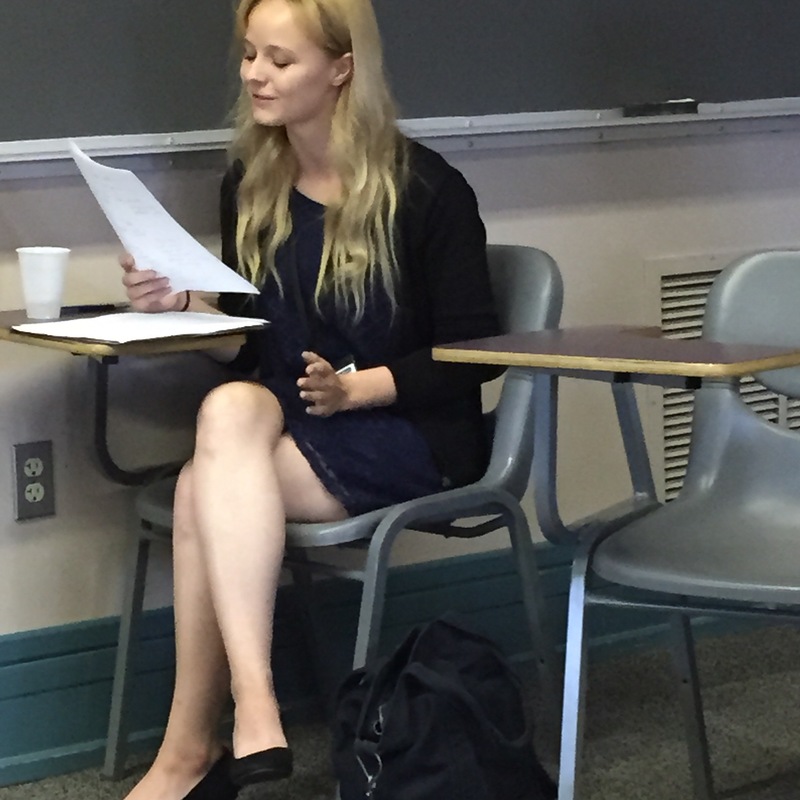 Ashley Michler, undergraduate at Bloomsburg University, presents her paper. The shuttle bus to and from Newark gave Woolfians coming from afar a chance to bond with each other on the journey. And the weather was, of course, perfect. To have so many Woolfians gathered in one place is always a peak moment of the year for me and, I am sure, for many others. To also have at the conference, in keeping with its inclusive title, so many scholars who study Woolf’s female contemporaries was a superb new feature and one that clearly will influence future research and create new connections among the various interwoven webs that connect Woolf to other modernists. That there were so many new faces was particularly lovely. The newcomers ranged from the modernist scholars to the high-school students who presented their papers with aplomb and confidence and from the graduate students who had never before attended this conference to the common readers who are always most welcome to join the Woolfian pack. Rumor has it that the annual Woolf conference is the very best first conference for graduate students because it is the most nurturing, and I can’t say I was surprised. But this one was particularly open to a range of participants. Conference participants had the opportunity to add their written tribute to Jane Marcus in a special journal. In addition to all the ebullient excitement of the conference, there was also a time of reflection. 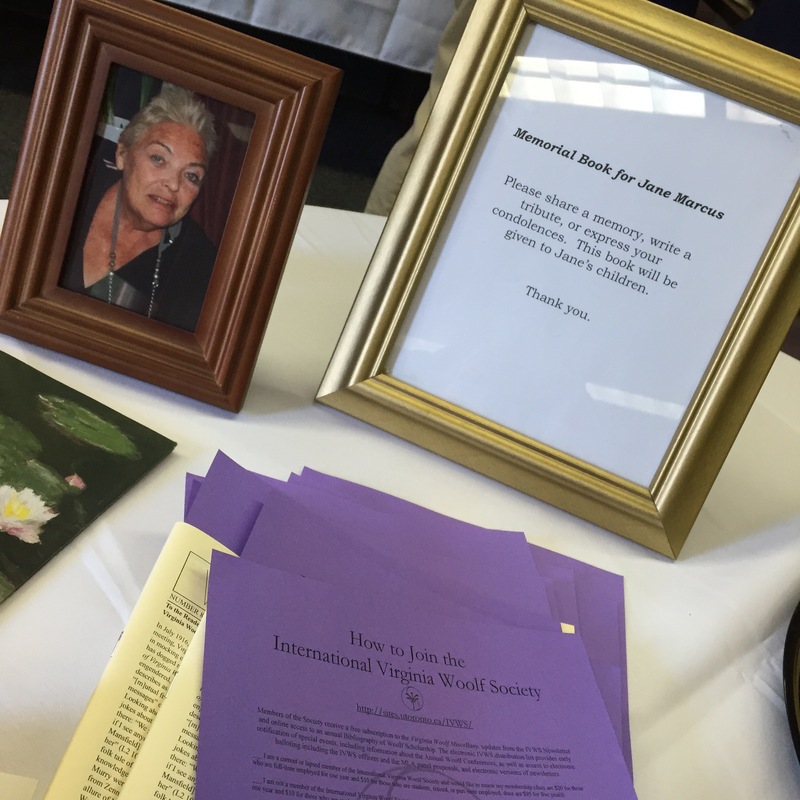 At the Thursday evening reception, Jane Marcus was remembered. Linda Camarasana, Mark Hussey, Jean Mills, J. Ashley Foster, and Suzette Henke all spoke and shared with those present their memories of a formidable and magnificent Woolfian who, among her many achievements as a teacher and a friend and a scholar was bold enough to challenge the conventional perception of Woolf as an aesthete and a mad woman and was among those scholars who brought Woolf’s work and her feminism, socialism and pacifism into focus in ways that will continue to endure. Jane Marcus’s landmark works include Art and Anger: Reading like a Woman and Virginia Woolf and the Languages of Patriarchy. Also remembered at the conference with sorrow and gratitude was Shari Benstock, some of whose most familiar works are Women of the Left Bank, Paris 1900-1940, Textualizing the Feminine: On the Limits of Genre and the co-edited A Handbook of Literary Feminisms. These two women truly shaped the way we read Woolf and her contemporaries. I was very glad that both were acknowledged. For those of you who weren’t at the conference and would want to “see” it, you should check the social media. 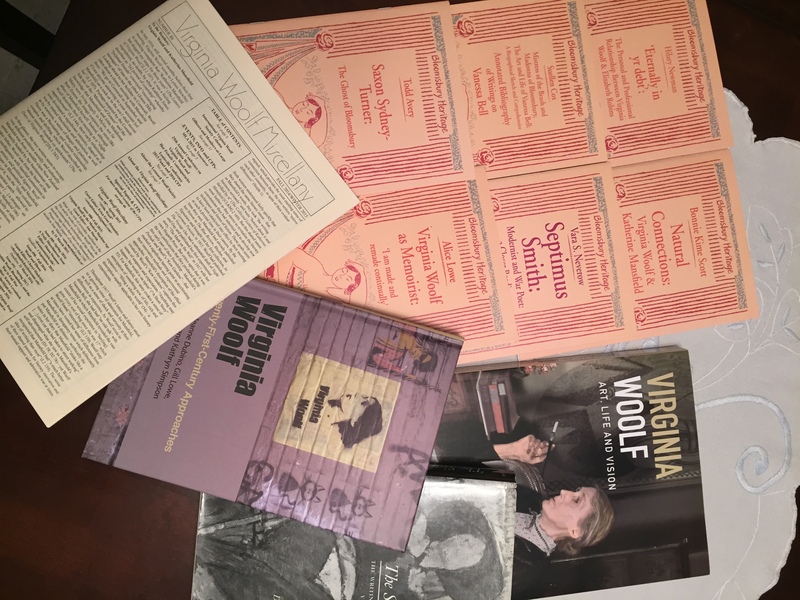 There have been lots of postings on the conference’s Facebook page, on the Blogging Woolf Facebook page and on the International Virginia Woolf Society Facebook page, as well as on the Blogging Woolf website. You can also go online on Twitter at https://twitter.com/hashtag/woolfconf15 or with the app at #woolfconf15 to see comments about the conference. Finally, for those of you who want to share your remembrances of Jane Marcus and Shari Benstock, I encourage you to send me your recollections for The Virginia Woolf Miscellany. I will be compiling these contributions to a section of a future issue. Remembrances of all aspects of the conference itself are also very welcome. I am deeply grateful to all those who worked so hard to make this unforgettable conference possible. This was a truly stellar labor of love, and one that will always be cherished by those who attended. This was my first Woolf conference. I was attending as an independent scholar and was concerned that I would stick out or that I would be the only person who didn’t know anyone there (that the tiger would leap, you might say). But both conference organizer Julie Vandivere and Park professor Lolly Ockerstrom, in separate correspondences, assured me that the Woolf scholars were a particularly warm and friendly group, so I decided to give it a try. I’m so glad I did! Everyone WAS warm and friendly – and seemed so happy to be there. I learned so much, but more importantly, I got to share my love of Virginia with so many other enthusiastic, knowledgable fans. Such a treat, from beginning to end.